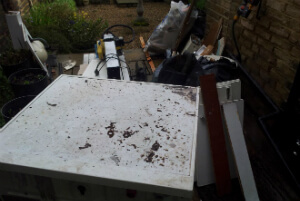 Residential & Industrial Rubbish Removal Woodford Green IG8 | Quality Property Care Ltd. Call the helpful client care service or get in touch with it online, with a description of the junk you need removed and disposed of, and you will obtain a preliminary estimation of the cost of the junk removal service. We are also effective at removing organic and garden waste starting with grass trimmings and cuttings, soil and turf, hedges and hedge trimmings, garden weeds, plastic bags or liners, plants and flowers, litter, leaves, small branches, twigs, animal bedding or straw, Christmas decorations and trees, plant pots and a lot more. There are special collection points where we will leave these materials, however, there are special fees that you might need to cover up. Once you arrange the rubbish removal service, we will sent to you the vetted and tested experts. They will evaluate the quantity of junk and will arrange a date. Make a combo with junk removal service and any of our professional cleaning services to get an exclusive discount! Our rubbish removal firm provides a full range of competitive and eco-friendly cleaning services that can match any funds! Junk removal services from Quality Property Care Ltd. is out there for you. The helpful and supportive experts work every day - with no exclusion for saturdays and sundays or national holidays. You can organise an express service or to name your personal instruction about the treatment. If you have any concerns about the rubbish, we give a free consultation with free tip on the organization. Get in touch with our professional rubbish removal client support associates right away! Use this phone number: 020 3746 4287 to get more detailed info or to set up your junk removal service. Note that we are available for express services. Re-scheduling is OK and 100% free. Book Quality Property Care Ltd. Junk Removal Call for Special Prices! Give us a call 020 3746 4287 anytime you need professional junk and rubbish removal from your property. We work efficiently and fast, dealing with loads of all sizes from large to small ones. Contact us at any time of the day or evening, you will get proper information on our details, pricing about the removal and so on. Our staff is available free of cost, with booking form opportunity. Phone call and save not only time, but also cash and efforts.